The last time Liverpool faced both Manchester clubs and Arsenal in their opening 5 fixtures, it was the baptism of fire that immediately showed up Roy Hodgson. Roy’s Reds took 1 point from these fixtures, earned in the opening day home draw against Arsenal. Brendan’s Reds have walked away from their first 5 fixtures with a similar result – 1 point earned against Man City. But the similarities stop there. Regardless of the fact that these matches were played at home, facts do not lie. Liverpool, with a new manager, adjusting to a new system, played against established sides that finished 1st - 2nd - 3rd the season before. Kenny’s Liverpool from last season managed 2 points in the exact same fixtures – and he had the fortune of not having these games in such close proximity to one another, at the start of the season. And anyone sensible who watched the matches under Rodgers would have seen that stupid defensive mistakes (and a “complicated” referee, in one case) undermined positive performances in all 3 fixtures. But of course, many Liverpool fans were, and still are, even with the recent 7 points from 9 available, insistent on judging the team too early, and losing total faith with the system and Rodgers himself. That’s not to suggest the results are acceptable. Of course they are not. Liverpool are hardly the type of club to be satisfied with even the recent 7 point recovery (against Norwich, Stoke and Reading) that has culminated in a current 12th place slot in the league table. I’ve seen these sentiments echoed on social media, informed blogs and pub conversations, and the concerns seem to be the same. 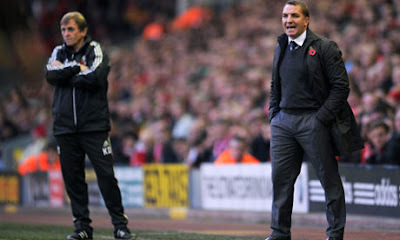 Would results be different under Dalglish? Is Rodgers really the man to take the team forward? We can’t know what the results would have been under Kenny, but of course, so many things would have been substantially different, and all we could do is speculate about the transfers, the tactical decisions and, ultimately, the results. Can we really know if Kenny would have offloaded Charlie Adam? Would he have even considered someone like Joe Allen? There are clear signs to read in the Rodgers regime, and one just needs to pay attention to them. Some fans suggest that Kenny’s Liverpool also prioritised passing and held possession well. The statistics do correspond to this. But there is a marked difference in the approach under Rodgers. Liverpool now play far more patiently, dominating possession to far greater levels, with less emphasis on a more direct attacking style. It’s not to say that a patient approach hinders the effectiveness of the attack – in fact, I’d argue Liverpool’s ability to penetrate defences is better now than it was under Kenny. At times, it sometimes felt like Kenny’s Liverpool relied a little too much on that flash of individual brilliance from someone to make the difference in a game. Under Rodgers, that reliance is decreased to an extent, because the team’s tactical approach is far more conducive to being more creative in the final third. We’ve seen goals this season from various players, and what’s been encouraging is the fact that many of them have come from midfield already – Gerrard, Sahin, Shelvey. Suarez may have missed a ton of chances under Rodgers – but I’m struggling to remember him getting so many clear, obvious chances under Kenny. We can bemoan Andy or Luis’ conversion rate under Kenny, but good chances were at a premium. Now, the team is better configured to creating the right quality of chance, as opposed to a huge quantity of them. Under Rodgers, Liverpool are also, quite significantly, playing 4-3-3 and similar variants (4-2-3-1, 4-3-2-1, etc). Kenny often used a 4-4-2 system. Kenny also focused on very different types of players, and prioritised different technical qualities - for example, if he was still manager, would Suso have played as much? Or would we still see Stewart Downing bombing crosses expectantly, hoping for bodies in the box? Would we have been hoping for one of Carroll’s rare standout performances as opposed to the intelligent off the ball movement of Borini? Again, it isn’t fair to speculate, but it isn’t clear that Kenny would have applied Suso and Sterling (in particular) as consistently as Rodgers. And both those players are two standout performers thus far this season. You can’t win anything with kids… or can you? Alan Hansen’s infamous quote above has run miles in my head since the season’s start. Rodgers has been true to his word about playing those who illustrate that they are good enough. If the likes of Sterling and Suso can keep someone like Downing on the bench or out of the squad, it says a lot about the tactical and technical priorities of the Liverpool manager. I, for one, cannot help but feel a significant debt of gratitude to Rafael Benitez. The legacy he has left in the academy with bringing players like Sterling, Suso and Shelvey to Liverpool may well be his most significant long term contribution. Rodgers’ application of the “kids” is significant. The 3 mentioned above along with Wisdom, Allen, Borini and Coates have all had moments of sparkle – some more than others (Sterling and Allen have arguably been Liverpool’s best players thus far this season). Rodgers has had no favours done to him by recent history - Liverpool’s last few transfer windows have had more bad memories than good. Ex-Red Dietmar Hamann emphasised that point in his recent tweet about Liverpool’s spending last summer in particular, which set terrible precedents in what Liverpool pay for players, not to mention which players were chosen to be signed. Imagine for a moment if instead of Downing, Liverpool had pursued Juan Mata, as was rumoured. It could have been the Reds dialling 9-Juan-Juan on occasions where attacking impetus was required. But as it is, Rodgers is getting some unique performances out of the youngsters. The Capital One Cup match against West Brom was, for me, Liverpool’s most complete performance thus far, if nothing else because a significant number of Rodgers’ boxes were ticked. Patience, possession, passing, penetration. Defending with the ball. And a winning goal which was ultimately created by the system, not by one player’s unique individual brilliance. Most of the team that produced that was 22 or younger, with only Downing, Carragher, Assaidi and Sahin as the “elders” in the team. From a transfer point of view, Rodgers’ gem is by far Joe Allen, and I hardly think many Liverpool fans will disagree that a midfield 3 of Gerrard, Sahin and Allen looks far more intimidating than last season’s dysfunctional configuration of Downing, Gerrard, Adam and Henderson. When Lucas comes back, it’s going to be intriguing. We haven’t had a midfield orchestrator of Allen’s quality, with fantastic awareness, ball control and passing touches since a certain Xabi Alonso marshalled the midfield. If Allen and Lucas (in theory) are automatic first choice players, it could be an interesting competition between Sahin, Shelvey and Gerrard for the final attacking midfield spot (especially considering Gerrard’s form is mixed at present). Naturally, the positives need to be taken account with a sense of perspective. It’s clear that while Liverpool has made progress, there are still several things that they need to work on. One thing that has been very common in Liverpool’s adoption of the system is the issue of holding the ball, especially when defending a lead. The match against Reading was a blatant example of how not to do it – it became more “death by football for anxious Liverpool fans” rather than for the opponents. Ironically, I think it was still an important result. Liverpool produced a 6/10 performance with a clean sheet and 3 points, and most importantly, got away with it. Notwithstanding the striking issue, and Suarez’s inability to score the “easier” chances, Liverpool have to be realistic that until they can recruit a quality #9, they need to get used to defending with the ball and stacking up the 1-0 wins. That’s why, in a strange way, the disappointment of deadline day has a unique silver lining – the lack of the goalscoring punches means that the team will be forced to master certain aspects of the system which otherwise may have been treated with complacency. Understandably, it won’t happen overnight. After all, typically if Liverpool is 1-0 up, one doesn’t exactly expect the voices in the Kop to cheer for defending with the ball. 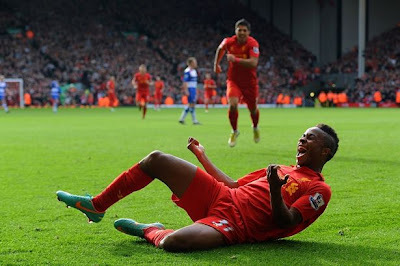 The last 10 minutes against Reading were completely characterised by long “Hollywood” passes down the field, anxiously being chased by Sterling and Suarez, but ultimately resulting in careless turnover of possession. Liverpool eventually needs a mindshift, and the execution on the pitch will follow. I would argue, ironically, that the 2nd goal would have been far more likely to arrive if the ball had been retained better. Reading, needing to chase the game would have tired themselves out and overcommitted in attack, leaving far more favourable spaces for Liverpool to exploit. And besides, one thing that we can all guarantee is that it would be impossible for Reading to get back in the game without the ball; hence the importance of making them work for it! One of the biggest culprits here is Steven Gerrard. This is dangerous territory for me to criticise – after all, Gerrard often plays that long ball because his vision allows him to get away with it and the result is often outstanding. 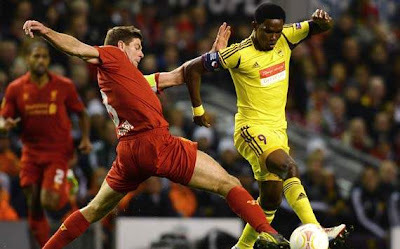 I hope that Gerrard, and many of the others who prefer those long passes will take their cue from Joe Allen. He is a great example of the right attitude towards retaining the ball, playing the short passes that may not be spectacular, but keeping the ball. Something else that has been inconsistent is the pressing and the defensive shape of the team. For example, against Manchester United, Liverpool immediately defended far too deep following Gerrard’s opener – their defensive line was just about on the 6 yard box for Rafael’s strike. Man Utd didn’t play their way into Liverpool’s box through superior skills or attacking movement – Liverpool practically invited them in. There are many other examples where the pressing game dropped off, especially against Udinese, and the 2 goals conceded against Norwich. Not that Liverpool should be pressing too much – you can’t press for the full 90 minutes - but that’s where defending with the ball comes in handy to help the players rest. So the two concepts are always going to be linked. Liverpool’s movement to create space and passing options is also in need of improvement, especially in the final 3rd. Sometimes the players look static and it takes a skilful move from an Allen (usually) to beat or attract defenders and open up a pass. It was intriguing that instead of berating Skrtel’s poor pass to Reina against Man City, Rodgers instead suggested that he was concerned that Skrtel’s teammates hadn’t given the Slovakian enough passing options, forcing him into a dangerous pass. I’m sure many Liverpool fans would disagree with the assessment, but it does illustrate just how the manager wants his team to implement the system. Other intriguing issues have been highlighted – is Suarez really fit as the #9? Once a #9 is signed, will Suarez be more heavily leveraged as the creator? His assists against Norwich and Reading certainly provide some evidence. Does Gerrard warrant his automatic starting place anymore? The form of Shelvey and Sahin, added to Gerrard’s costly turnovers of possession, do build a case, but there must be doubts if Rodgers really has the courage to drop the talismanic leader. There are also hints already of possible further transfer priorities in January. The natural #9 is the obvious one, but Liverpool also need further cover for Lucas (Allen can deputise, but he can’t play every game either! ), possibly Reina (although Brad Jones is certainly playing his way into consideration) and without doubt, a new first choice left back if Jose Enrique cannot meet the standards that Rodgers has set (I wonder if the Spaniard is not another name in those infamous envelopes). But while there are things that need improvement (and there always will be), there are definitely signs that Rodgers’ regime is beginning to show fruit. For starters, Liverpool haven’t had a controlling midfielder the quality of Allen since Alonso, and that is possibly an understatement since the Welshman has already drawn comparisons with the Barcelona maestro Xavi. Allen is just 22, and it’s scary to think the recently crowned Welsh player of the year could be even better in a couple of years. Rodgers’ other signings have also had their moments. Sahin already looks a dangerous prospect in that attacking midfield role, while Borini’s off-the-ball movement has already paid dividends – check out how he opened up space for Shelvey’s second goal against Young Boys as an example. The emergence of Sterling, Suso and Shelvey in particular into the system is fantastic. All of them have made significant contributions. Sterling’s impact has been incredible, and someone of his ability to keep his head up and be more aware of the options around him can only flourish in a system like this. Suso is also well suited to the Rodgers style, and his second half substitute cameo appearance against Man Utd was quick to produce a meaningful attack that led to Gerrard’s goal. What has been most impressive however, is how the team has taken to the passing style. It’s not perfect, but pragmatically, I was expecting the team to struggle to adapt. That adaption has been faster than expected. Liverpool look a far stronger team tactically. They play attractive football. They are creating greater quality of chances and even though several players have been offloaded, the system is threatening to bring out the best in many players, and suddenly even Steven Gerrard has potential competition for his 1st team place. 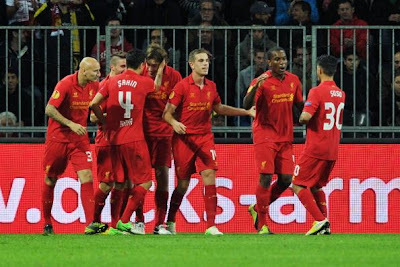 Liverpool’s second string side has looked effective – granted, they lost to Udinese after the wheels came off in the second half, but the first half performance provided clear evidence of what they are capable of. They were never going to get it right perfectly, but the system is coming together. When, as examples, youngsters like Jack Robinson or Andre Wisdom can play under a system like this and look effective enough to compete for first choice fullback positions, that creates depth practically out of nowhere. The tactical approach is extremely sound. Only in one game so far this season has Liverpool been tactically outsmarted – against Arsenal (and even that may be of debate). The rest of the poor results come down to poor execution of great tactics, a far cry from some of last season’s matches where Liverpool’s tactics weren’t always designed to get them to naturally come out on top. For example, contrast the home fixture against Man City last season, where the game was relatively even, vs. this season – Liverpool were by far the dominant side this time around – points were dropped due to stupid mistakes, as they were against West Brom. Even with 10 men, Liverpool dominated Man Utd and still deserved the 3 points against the old enemy. That comes down to the value and strength of the system that Rodgers has introduced. There may still yet be speedbumps – Liverpool enter a difficult patch of fixtures with Everton, Swansea, Newcastle and Chelsea coming up. But even if the results aren’t ideal in those matches, the signs are there for Liverpool fans to see the improvements, if they choose to. And if we can be patient and allow the team to continue working to master the system, allow the January transfer window to bring its reinforcements (hopefully! ), and tolerate the results for a bit… it’s possible that Liverpool could surprise us all. Time will tell – we need to support in spite of the results… and be patient.